ANSYS, Inc., a global innovator of simulation software and technologies designed to optimize product development processes, announced that the winner of the 32nd America's Cup, Alinghi, used ANSYS technology to predict the effects of design changes on yacht performance. With both finalists' yacht designs optimized with ANSYS simulation software, Alinghi and its challenger were each prepared to take home the Cup, but Alinghi successfully crewed their racing yacht to defend the America's Cup, the most prestigious and elite competition in the yachting calendar. ANSYS, Inc. has a track record of success in the America's Cup. Alinghi as well as the winners from recent cup challenges have benefited from ANSYS software, illustrating the essential role ANSYS technology plays in world-class racing (as well as other performance-demanding fields). "ANSYS software has proven to be a key tool in the design of our winning yacht. From a multiphysics perspective, the insights the finite element analysis modeling gave us regarding the stiffness distribution design of the yacht and mast delivered a noticeable performance edge. The design improvements that we made as a result of the computational fluid dynamics analyses conducted with ANSYS software significantly increased the speed of the boat - and aided us considerably in defending the America's Cup," said Michael Richelsen of the Alinghi design team. The leading America's Cup teams expend more than 150,000 labor hours to optimize the design of their boats - analyzing, for example, the power generated by the sails, the drag produced by the boat's hull and the air resistance of the deck. Multiphysics simulation has shown that hulls, masts and keels clearly are not rigid and behave differently under varying and extreme hydrodynamic conditions. Minute changes in these areas can make the difference between winning and placing second. Using software from ANSYS, Alinghi performed a series of complex, leading-edge computer-aided engineering (CAE) simulations designed to understand yacht performance down to the smallest details. The racing team utilized ANSYS(R) CFX(R) computational fluid dynamics (CFD) software to evaluate nearly every portion of the boat, including hydrodynamic flow (for the underwater portion of the hull), aerodynamic flow (for the sails) and the stiffness of parts of the vessel (for deck details such as winch placement and pillar shapes). To analyze and optimize structural aspects of the yacht, Alinghi employed ANSYS Mechanical(TM) software. This finite element analysis (FEA) encompassed everything from global modeling and optimization of the composite hull and mast down to detailed analysis of hardware components on the yacht. In the end, Alinghi identified an optimal hull design that minimized the weight of the yacht while ensuring it remained capable of withstanding the extreme loads experienced during competition. 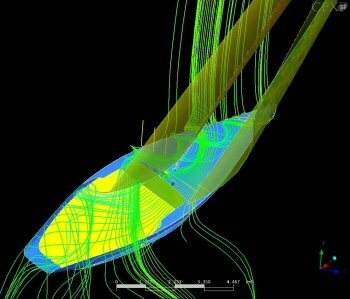 Engineering simulation is playing a crucial role in today's boat design process. Since this year's America's Cup races have been very close (with the yachts separated in most races by less than 30 seconds), tiny improvements become that much more critical. "An event such as the America's Cup calls for some of the most technologically demanding multiphysics simulations involving all aspects of the boat's air and water conditions," said Chris Reid, vice president of marketing at ANSYS, Inc. "From the simulation work Alinghi has done, we see that our technology can handle the most complex problems, especially as they push the limits of multiphysics. Most of the leading boats now use engineering simulation in some way; since 2003, we've been working with Alinghi to leverage the broad suite of products from ANSYS to their competitive, winning advantage." The America's Cup is the most famous and most prestigious regatta in the sport of sailing and the oldest active trophy in international sport, attracting top sailors and yacht designers. Although the most salient aspect of the regatta is its yacht races, it is also a test of boat design, sail design and management skills. Swiss team Alinghi won the previous America's Cup in 2003, becoming the first team since the inaugural race in 1851 to return the cup to Europe and the first team to win the cup on a first attempt. CFD simulates the wind flowing over the deck and cockpit of the Alinghi boat. Note the vortex hat formed in the bow where the wind wraps around on the deck. Image courtesy of ANSYS, Inc.